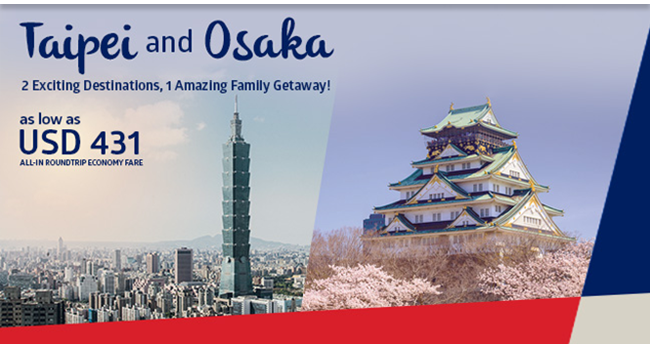 Travel to two of Asia’s great cities – Taipei, Taiwan and Osaka, Japan – all in one go! Embark on a trip of a lifetime to two of the must-visit cities in Asia. Go up Taiwan’s outstanding landmark, the Taipei 101, and enjoy a spectacular view of the city from the Observatory at the 89th floor. Then shop and have a taste of Taiwan’s fried chicken and signature beef noodles at Shilin Market. Continue on your journey to Osaka and experience the fusion of new and old-world Japan. We fly daily from Manila to Taipei and onward to Osaka starting June 25, 2016. Enjoy a heartwarming travel experience with the airline that celebrates the Heart of the Filipino. Book your flights now! Selling period: June 20 to August 31, 2016. Travel Period: All year-round, ticketing must be completed at least 60 days before departure. Seats are subject to availability. Fares are valid for roundtrip travel. Fare is inclusive of government taxes and fees and surcharges. Exclusive of Philippine travel tax and ticketing service fee. No-show fee is USD75. Ticket is non-refundable. Non-rebookable on the same fare. Upgrade to higher fare allowed subject to USD100 change fee. Child fare is 75% of adult fare. Infant fare for infant without a seat under 2 years is 10% o adult fare. 50% Mileage accrual. Other travel conditions apply.